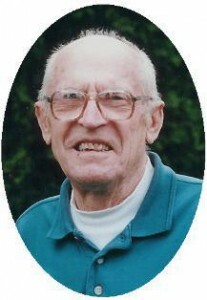 N orbert F. Buivid, 83, of E Pierron Street in Port Washington died Tuesday, October 19, 2004 at his residence. He was born in Sheboygan, Wisconsin on August 11, 1921 to Louis and Victoria Schimkus Buivid. A 1938 graduate of Port Washington High School, he was a sportsman and played football. He also worked as a pinsetter for the former Bley’s Recreation. In September of 1942 he entered the Army and served in Hawaii during World War II. He was discharged in November 1945 with the rank of Private First Class. Upon his return he took a job at the Wisconsin Electric Power Plant in Port Washington and retired 38 years later as a mechanical rigger in 1983. He was a member of the International Union of Operating Engineers, Local 317. He met JoAnn Watry of Port Washington and they were married July 21, 1951 at St. Mary’s Catholic Church in Port Washington. He was active in the Port Senior Center and the Green Felt Club. An avid golfer he participated in the Squire’s Sundown League and was very proud of his Hole-in-One on Squire’s #6 in May of 1985. He is survived by his wife JoAnn of Port Washington, 4 children, Jim (Barbara) Buivid of Grafton, Mary (Michael) McConnohie of Germantown, William Buivid of Sheboygan Falls and Joseph (Paula) Buivid of St. Louis, MO. He was a proud grandpa of Aaron, Lauren and Blake Buivid, Chase and Brittney McConnohie and Ashleigh and Jessica Oliverson, Further survived by brother-in-law Ray Visser, nieces, nephews, other relatives and friends. Preceded in death by sisters Wanda Visser, Jeanne Moldenhauer, Alvina “Nina” Schiller and brothers Raymond and Daniel Buivid. The Rev. James Ernster will celebrate a Mass of Christian Burial at 7 pm Friday, October 22, 2004 at St. Peter Of Alcantara Catholic Church, 1800 N Wisconsin Street, Port Washington. Entombment in St. Mary’s Cemetery. Visitation from 4 – 6:45 pm Friday at St. Peter Of Alcantara Catholic Church. Memorials to Special Olympics or of choice appreciated.